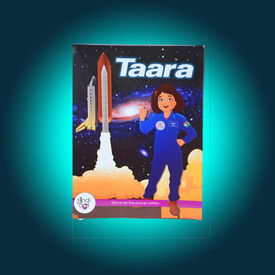 Taara is a book about an eight-year old girl living in modern India. Meet your new friend Taara, an eight-year old vivacious girl from Bangalore whowants to fly an airplane. Just like you, she loves to play with her friends. When a science mela is announced at school, she prepares the most wonderful presentation. But almost might not be able to participate!! Will she be able to take part? Will she be able to win the special prize at Mela? Will she be able to fly? Come, find out all this in Indidoll's new release - "Taara", A story about a little girl who is inspired by one of India's smartest women! Taara is a book about an eight-year old girl living in modern India. Synopsis: Meet your new friend Taara, an eight-year old vivacious girl from Bangalore whowants to fly an airplane. Just like you, she loves to play with her friends. When a science mela is announced at school, she prepares the most wonderful presentation. But almost might not be able to participate!! Will she be able to take part? Will she be able to win the special prize at Mela? Will she be able to fly? Come, find out all this in Indidoll's new release - "Taara", A story about a little girl who is inspired by one of India's smartest women!